The new Twingo has a short front overhang and will be sold only as a five-door. 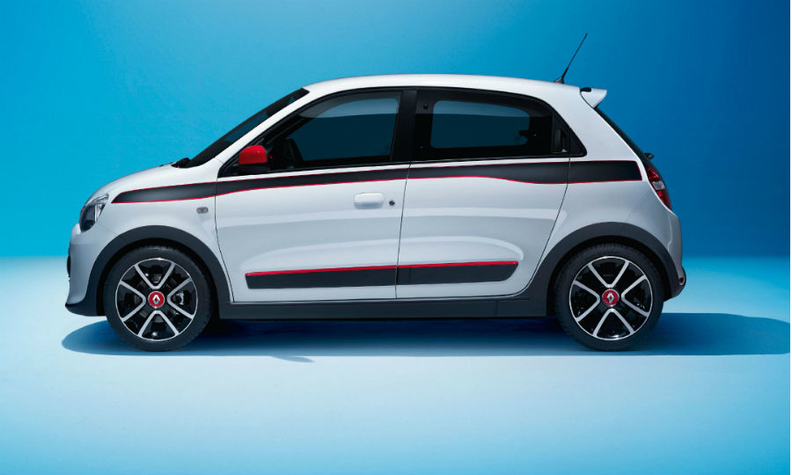 PARIS -- Renault is touting a sporty design, maneuverability and a roomy interior as features that will boost sales of its new rear-wheel-drive Twingo in Europe's highly competitive minicar segment. The Twingo's new rwd layout, which is highly unusual in the minicar segment, will give the car agile handling and the engine's location under the trunk creates more cabin space, Renault said in a statement. Both also help to make the car easy to maneuver in built-up areas and in tight parking spots, the company said. "Positioning the engine at the rear is a significant plus for a small city car since it frees up the front end and considerably improves the turning circle," the statement said. "It is a modern take on the city car genre with the accent on innovation in terms of its lines and architecture. The new Twingo is a fun, playful and vibrant city car," Renault head of design Laurens van den Acker said in the statement. The Twingo's rear door handles are concealed just like on the Clio compact. The Twingo has been jointly developed with Daimler and it shares an all-new platform with the new Smart ForTwo and upcoming Smart ForFour. 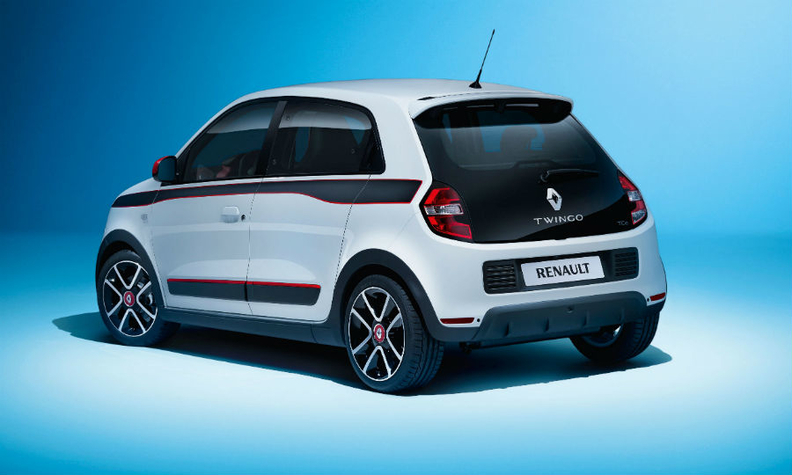 Renault said its strategic cooperation agreement with Daimler, which was concluded in 2010, allowed its engineers and designers to start from a blank sheet of paper for the third-generation Twingo. The developers took inspiration from the original Twingo launched in 1992 and the popular Renault 5 sold between 1972 and 1996. The Twingo will switch to a five-door layout. The current car is offered only as a three-door model. It will go on sale shortly after its debut at the Geneva auto show on March 4. Renault aims to win sales from the segment-leading Fiat 500 and new rivals such as the Opel/Vauxhall Adam by offering buyers a similar range of personalization options including four body colors, and customizable exterior trim features such as the door mirrors and side protective moldings. The Twingo has a wide glass hatch at the rear and the rear lights are a natural prolongation of the tailgate. 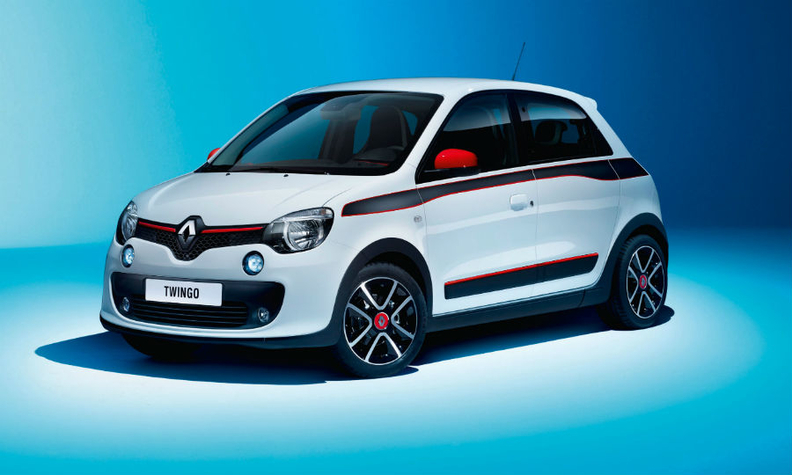 Renault did not disclose pricing or engine options for the Twingo ahead of the car's Geneva debut. The Twingo's European sales fell 15.5 percent to 77,744 last year, according to JATO Dynamics market researcher.